I think this a very post of me doing a "themed" manicure on the holiday! ;) I've had this polish sitting in my collection for sometime now and when I couldn't figure out what else to wear, I remembered it! Except for the added stars, this polish is exactly the same as Pure Ice Twist and Shout. 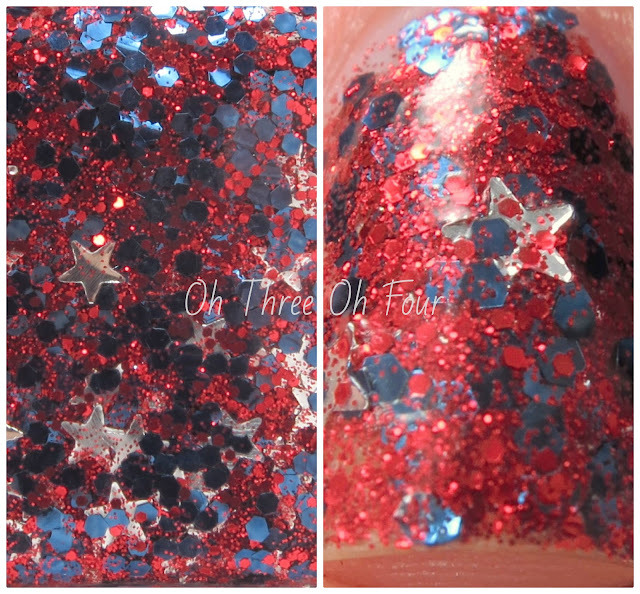 So if you missed picking up Twist and Shout when it was released late last year you still have the chance to get the same polish with added stars! Pure Ice Freedom contains micro red glitter, medium sized blue, red hex glitter and silver stars all in a clear base. I used 3 coats a top coat of Seche Vite and Gelous. Pure Ice polishes are available at Walmart in store and online through Bari Cosmetics. Find Pure Ice on Facebook, Instagram, Twitter and Pinterest.